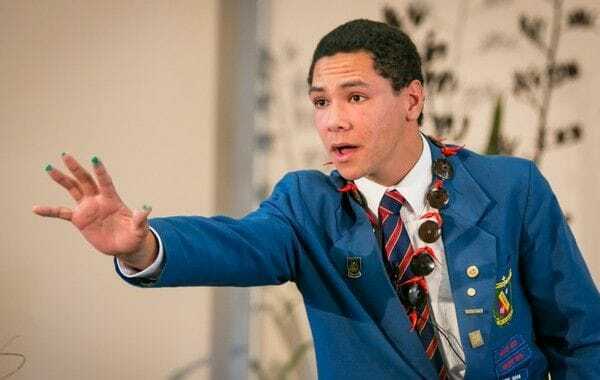 The Head Boy of Francis Douglas Memorial College in New Plymouth, Polaiu'amea Kirifi has been declared runner-up in a national public speaking competition for New Zealand schools, aimed at promoting racial harmony. The annual Race Unity Speech Awards were initiated by the nation's Baha'i community in 2001 and have been sponsored by the New Zealand Police over recent years with strong support from the Human Rights Commission. 150 students entered the competition this year and they were all asked to focus their speech on the central theme- "Stand Up for Race Unity- Don't Be a Bystander!" The speechmakers were asked to focus on what they could do to inspire others to stand together for race unity in New Zealand. In his speech, Francis Douglas Memorial College student Polaiu'amea Kirifi drew upon his Samoan heritage, comparing the bringing together of different cultures with constructing a 'fale' or house. "See the true strength that holds the whole fale together? ", Polaiu'amea asked those gathered for the competition final in Auckland. "That's the afa- the plaited coconut fibres, that when woven tightly can hold something as large as a fale", he added. "In my lifetime, I would like to see an' afa being woven tightly around our differences, holding us together with love, forgiveness and belief, in unity". In recognition of his outstanding achievement as runner-up in the competition, Polaiu'amea was presented with a personal and school award by the Race Discrimination Commissioner, Dame Susan Devoy. Francis Douglas Memorial College students also joined in a boisterous haka to mark the achievement. Representatives from the New Zealand Police, including Area Commander Keith Burrell were also at the presentation ceremony at the school, alongside Jill and Mervyn Chivers from the Baha'i community.